Yep, it’s true – we have both taken up smoking. Last night we both smoked more than a packet each. We have no chosen brand, just whatever the crowd in the nightclub we went to last night was smoking. We woke up this afternoon (we arrived at midnight, and sat with a sad and tragic drag queen for company until two in the morning when everyone else started to arrive and danced till 4am) and everything stank of smoke, even my underwear! We are in Mendoza, one of the wine regions in Argentina, about a two hour flight from Buenos Aires. 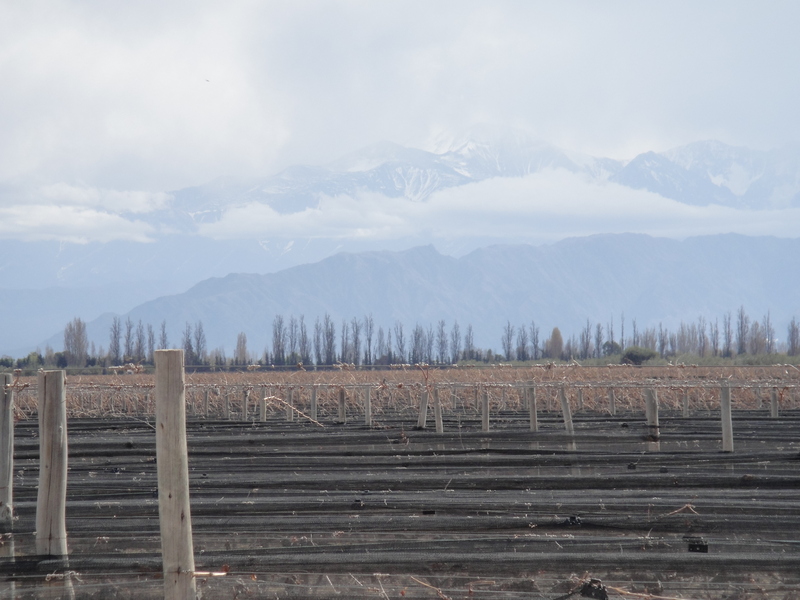 The city and vineyards are in a desert; everything – including the street trees – is watered by irrigation from the snow of the Andes. The city looks up to the Andes that border one side of the valley; it would even be impressive for you Vancouver folk! So Mike and I hired a driver and English-speaking guide (who has had some wine making experience) and visited three vineyards about an hour and half drive from Mendoza. Valle de Uco is 1200m above sea level and grows mainly Malbec grapes. Our last vineyard was described as a temple to wine, an incredible design. Here we had lunch gazing at the snow-capped Andes surrounded by desert, quite an incredible experience, even after all the wine. So we better get up and head out for breakfast, well lunch actually. Something very, very greasy after all those cocktails. We initially thought the free pouring the bar man did was a good thing, not so sure this afternoon after two panadols and a bottle of water. This entry was posted in Argentina and tagged Mendoza. Bookmark the permalink.